You may have noticed, but I’m pretty sure even my own mother has a comeback scheduled for September. I’m a bit overwhelmed and you want to know what’s making it worse? All of the darned teasers. This is a phenomenon in Kpop that I have never experienced in American music – either because it doesn’t happen quite as obviously or I have just never gotten sucked in by them. But for some reason, and it could be because people send me easy to click on links, I totally get the Kpop teasers and adore them. They get me all worked up and either excited or devastated depending on what they contain. But back to September. 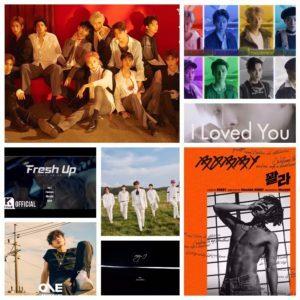 There are a million much-anticipated releases that started on the first with groups like 10cm and Crush with Seo Taiji and are continuing through the whole month. It’s like all of these groups FINALLY stopped coming to the US to do shows (to hopefully save me a few bucks and get me back in my family’s good graces) and decided that they would rush into the studio (so I would have to shill out a few bucks and annoy my family as I learn all the new songs). The releases are a mix of new or repackaged music (lame) with some big groups coming out on the same day. So, because I am a somewhat good friend, I have compiled the teasers for a few of the things I am most looking forward to by date, and am sharing them with you. You will note, because I am the BEST friend, I have also included a special treat for two of my friends even though I am not particularly anticipating that specific release. It will be excellent, I will love it, I am just not in a tizzy about it. I won’t say who it is because I don’t want to hurt his feelings. Idols have feelings too, you know. OK, this is NOT a teaser, it’s a fan cam, but we think they are doing a video for this song because Seventeen put out a teaser gif thing. I want an official video so hard. This fan cam is exactly the reason why. I could watch this over and over. Luckily, I have what’s been released today to help me wait for what comes out tomorrow. Tell your mother that her violet-tipped mullet is going to look great in the m/v. Alex on Taiwanese LGBT Movies/Dramas I really want to watch Happy Together and Love To Our Youth, but I can't find them with subtitles. Help?